Welcome to The Coach House, our new family owned boutique, bed and breakfast. Located just outside the traditional market town of Dromore, Co. Down, with stunning views over the valley to the Gillhall Estate and River Lagan. We are just 10 minutes from the historic Georgian village of Hillsborough and only 25 minutes from the City of Belfast. The Kingdom of Mourne, with its spectacular mountain scenery and stunning coastline, lies approximately 40 minutes drive from us whilst the Giants Causeway and North Antrim Coast are easily accessible on a day trip. Newly constructed in 2016 from re-claimed architectural materials, the Coach House was designed by award winning architect, Des Ewing. The design is based on an original Irish cart house from circa 1850 with arches of red brick and re-claimed stone walls. The granite exterior staircase leads our guests up to the entrance hallway with its exposed period wooden floors and luxury vintage grandeur. Each of our 2 bedrooms are individually decorated and designed in an eclectic style with fine period Edwardian furniture and all the comfort of a small luxury hotel but retaining an intimate homely feeling. A warm Irish and personal welcome from Sharon and family awaits you. Decorated in a classic country house style in shades of muted green with rich purple accents this room has a beautiful Edwardian dressing table and wardrobe. The Capuchins fabric used for the curtains and bed-coverings depicts etchings of botanical studies and is complimented with a purple tartan from Zoffany. The ensuite boasts a large freestanding bath with over temple shower. The Amaryllis is also available as a twin bedded room.Decorated in a classic country house style in shades of muted green with rich purple accents this room has a beautiful Edwardian dressing table and wardrobe. The Capuchins fabric used for the curtains and bed-coverings depicts etchings of botanical studies. A light, luxurious and spacious bedroom decorated with beautiful Sanderson wallpaper depicting hummingbirds, butterflies and exotic flora. 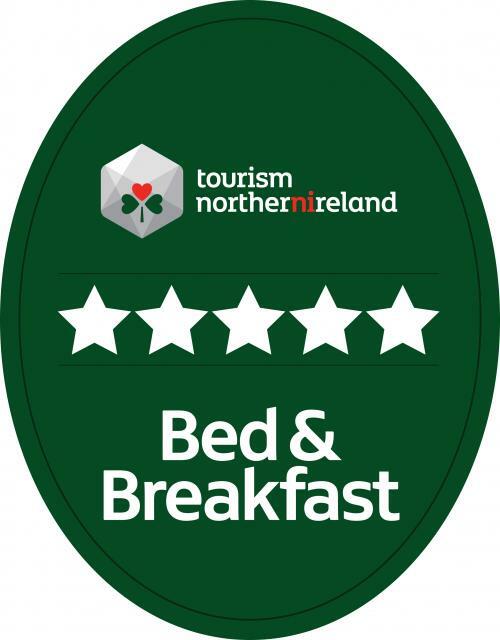 The King size bed has crisp cotton sheets, snuggable duvets, super soft pillows and hand quilted throw all supplied from Bedeck. The ensuite features twin sinks , window seat and large walk in "rainfall" shower with stunning Italian Carrara marble tiles.